If you are interested in set and forget it mutual fund (i.e. buy and hold fund), you should considered the following balanced funds. Balanced funds or hybrid funds are investment vehicle which invest in stocks (equities), bonds (fixed incomes), preferred stocks, convertible bonds, and money market. These balanced funds can be classified into several categories such as conservative allocation (higher bond component), moderate allocation (higher stock component), and world allocation (include foreign stock/bond component). These hybrid funds are suitable to investors who are looking for a mixture of income, safety, and some capital appreciation. 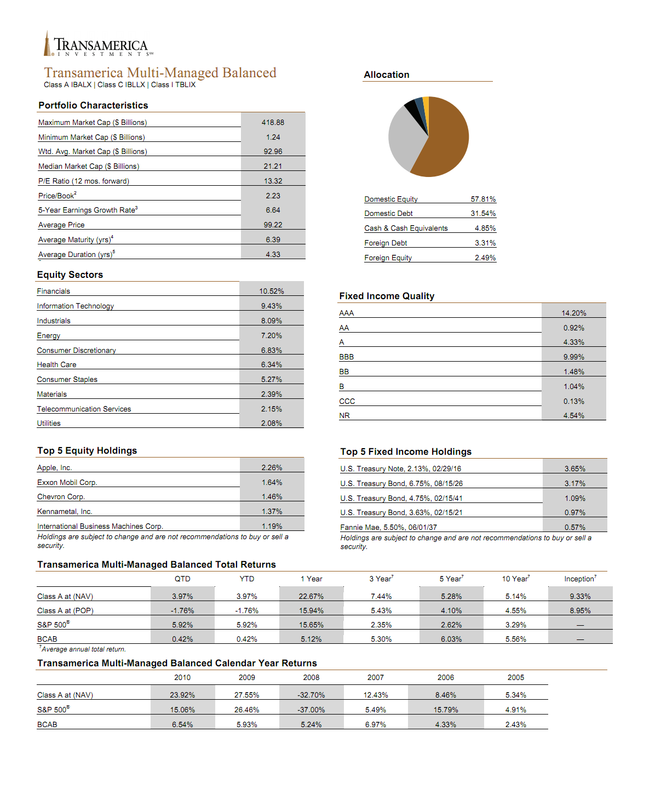 This article will look into the top performer moderate allocation balanced funds up to May 2011. The fund is sorted based on its performance up to May 2011. These moderate allocation balanced funds usually have about 30-50% fixed income component and 50%-70% equity component. Most of the stock portions are invested in large cap company with dividend yield. Note: For funds performance, please check table below. If you are interested in conservative allocation balanced fund, please check my previous article. As one of the smallest fund in this list, the JHancock3 Leveraged Companies fund seeks capital appreciation. The fund invests >80% of net assets (including leverage) in equity and bond of leveraged companies. The fund may invest <40% of net assets in debt securities, including up to 15% of net assets in securities rated in default by Standard & Poor's or Moody's, and their unrated equivalent. This JHancock3 fund may invest part of net assets (<30%) in foreign equities and debt obligations, including emerging market. The fund’s lead manager is Arthur N. Calavritinos since 2008. Initially, you will need $2,500 to invest in this fund. The fund’s expense ratio is 1.35% per year. There is management fee of 0.30% and front end sales load of 5.00%. This fund only has $1.84 million asset and relatively small compare to other funds. 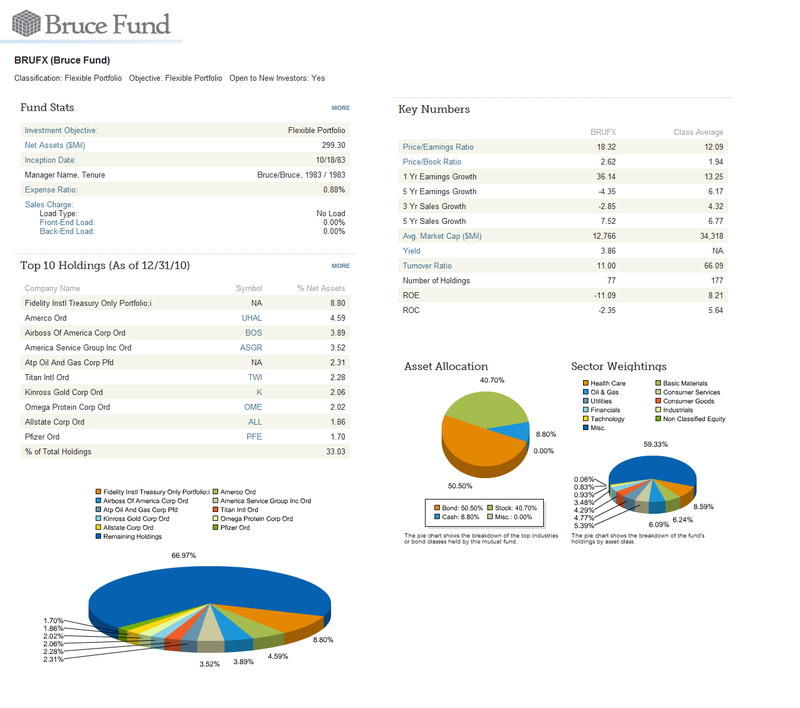 The Bruce fund objective is seeking for capital appreciation in long term period. This fund will invest its assets in domestic common stocks and bonds. This fund may invest in future interest and principal of U.S. government securities, also known as ‘zero-coupon’ bonds. There is no specification for the capitalization of the domestic common stocks that are invested. It may also invest in foreign securities and convertible bonds. This is the only fund offered by Bruce. This fund has been managed by Robert B. Bruce himself since the inception in October 1983. The last dividend distributed in December 2009 was 12.33% and capital gain distributed in 2008 was 4.08%. This fund is only available to be purchased for the brokerage account with the minimum investment of $1,000. As part of no load fund, there is no management fee and no sales load fee. The annual holdings turnover as of October 2010 is 11.41%, quite low compared to the average in the Moderate Allocation category which is 75.97%. BRUFX has 0.88% of annual expense ratio rate. And it has returned 25.50% over the past one year and 18.76% over the past decade. The fund has 5-stars rating from Morningstar. It has 11.73% of year-to-date return. The best performance of this fund was in 2003 with 66.82% within its 19 years of positive return record. While the worst was in 2008 with -27.27% return within its 8 years of negative return. The top 10 holdings of this fund as of December 2010 are Fidelity Institutional Treasury Only (8.80%), Amerco Ord (4.59%), Airboss of America Corp Ord (3.89%), America Service Group Inc Ord (3.52%), Atp Oil and Gas Corp Pfd (2.31%), Titan International Ord (2.28%), Kinross Gold Corp Ord (2.06%), Omega Protein Corp Ord (2.02%), Allstate Corp Ord (1.86%) and Pfizer Ord (1.70%). 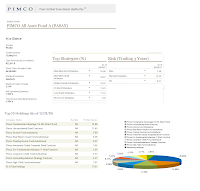 The investment objective of the PIMCO All Asset fund is to provide maximum real return. The fund investment strategy is to invest in Institutional Class or Class M shares of other funds of the Trust (except some funds). This fund does not invest directly in stocks or bonds of other issuers or in shares of the underlying funds. It is a non-diversified fund which invests in some diversified underlying holdings. PASAX has distributed 6.93% dividend this past year. Last dividend distributed in March 2011 was 0.05%. The expense ratio rate is 0.83% per year. The minimum initial investment to invest in the brokerage account of this fund is $1,000. There is no IRA account available. There is a 12b1 fee of 0.25% and sales load fee of 3.75%. This fund has returned 9.31% over the past one year and 5.38% over the past three years. The best 1-year return was recorded in 2009 with 22.20% while the worst 1-year return was in 2008 with -15.91%. PASAK has 5.77% of year-to-date return. Investor can also invest in other fund classes to get lower fees. The other class tickers of PASAX are PAALX (Admin Class), PASBX (B Class), PASCX (C Class), PASDX (D Class), PAAIX (Institutional Class), PALPX (P Class) and PATRX (R Class). The lead manager of this fund is Robert D. Arnott. He has managed this fund since July 2002. This fund can be bought from 92 brokerages include Td Ameritrade Inc, Scottrade Load, Merrill Lynch, Fidelity Retail Funds Network, Common Wealth Core, Raymond James, JP Morgan, Vanguard, Edward Jones, etc. 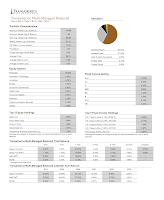 The fund has 78.0% of annual holdings turnover as of May 2011. 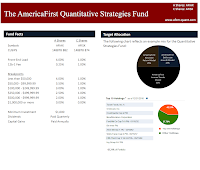 The top strategies of this fund are Alternative Bond Strategies (33.58%), Alternative Equity Strategies (18.57%), Inflation Related Strategies (18.22%), US Bond Strategies (11.23%), Long Equity Strategies (11.15%) and Short-Term Strategies (7.6%). The objective of Transamerica Balanced fund is to provide a high total investment return through investments in a broadly diversified portfolio of stocks, bonds and money market instruments. This fund is also known as Transamerica Multi-Managed Balanced. The percentage of the assets investment is 60% in equity series and 40% in fixed income and money market securities. It may also invest in short-term debt securities or cash and cash equivalent securities, and derivatives. The last dividend distributed in March 2011 was 0.06%. Greg Haendel has managed this fund since October 2008. The fund inception date was on December 2004. The minimum balance to invest in this fund is $1,000 for either brokerage or IRA account with $50 of minimum subsequent investment. The management fee is 0.35% and sales load fee is 5.50%. IBALX has returned 14.97% over the past one year and 4.39% over the past 5 years. During its 12 years of positive return, the highest fund performance was achieved in 1998 with 30.80%. And the lowest return so far was in 2008 with -32.70%. The other classes of this fund are Class C (Ticker: IBLLX) and Class I (Ticker: TBLIX). This balanced mutual fund has 1.56% annual expense ratio rate, which is a bit higher compared to the average in the category (0.99%). IBALX can be purchased from 85 brokerages include Vanguard, JP Morgan, Merrill Lynch, Schwab Retail, Edward Jones, Mony Securities Corp, Northwestern Mutual Inv Service, etc. 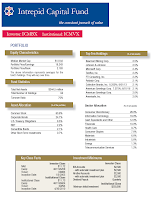 IBALX recorded 99.0% annual holdings turnover as of May 2011. The top 5 equity holdings are Apple Inc, Exxon Mobil Corp, Chevron Corp, Kennametal Inc and International Business Machines Corp.
With only $9.8 million asset, this SAAT Defensive Strategy Allocation fund objective is to generate investment income while providing prospect for capital appreciation. The fund invests in one or more of SEI funds that invest primarily in U.S. common stocks, short-term investment grade bonds, inflation-sensitive securities, and U.S. and/or foreign non-investment grade fixed income securities. This fund is part of fund of funds (FOF). The fund manager is James Solloway since 2010. It also has 1.34% annual expense ratio. The Montecito investment seeks long-term capital growth. The fund invests normally in the following 3 asset classes: equity securities, investment grade fixed-income securities, and real estate and asset-based securities. Blake T. Todd has been the lead manager of this Montecito fund since 2005. It has expense ratio of 1.19% per year. It also charges front end sales load of 5.75%. 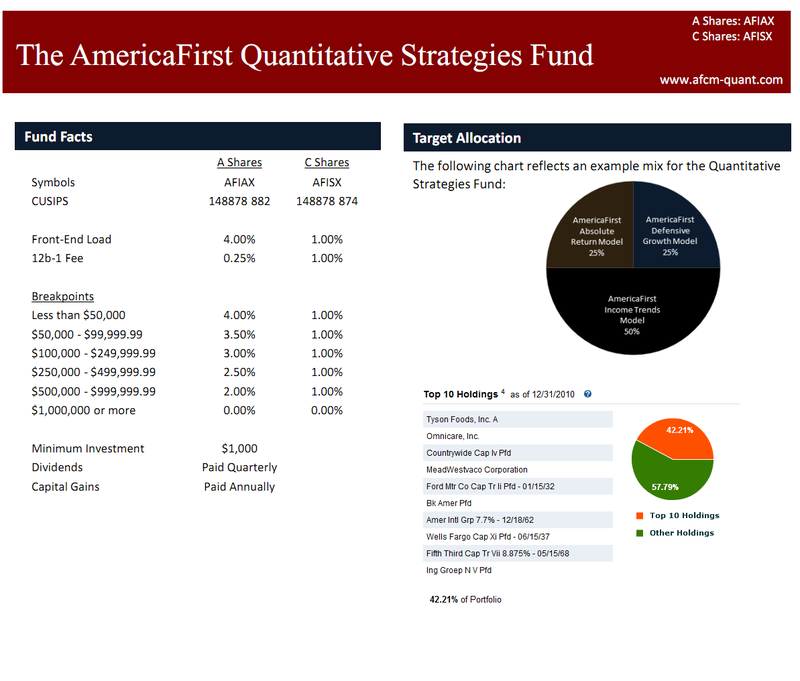 The objective of America First Quantitative Strategies fund is to achieve long-term capital appreciation. The fund is also seeking to reach positive returns through all market cycles. Under normal circumstances, IBALX normally invests in other investment companies including unit investment trusts, open-end management Investment Company, closed-end investment companies and exchange traded-funds. This AmericaFirst fund is also part of fund of funds. Rick Gonsalves has managed this fund since its inception in October 2007. He serves as the co-founder and President of the Advisor. To invest in this fund, you will need a minimum balance of $1,000 for brokerage and IRA account. Additional investment can be done with as little as $50. The management fee for this fund is 0.25% and the sales load fee is 4.0%. AFIAX has 1.59% of annual expense ratio rate. Since this fund is still considered quite new in the market, it has 8.09% of year-to-date return. It has experienced 2 years with up performance and 1 year with down performance. The worst 1-year return was in 2008 with -50.16%. It has returned 13.08% over the past one year and -3.97% over the past three years. Besides Class A, this fund has another C Class as well (Ticker: AFISX). This fund can be purchased from only 20 brokerages such as Pershing Fund Center, Td Ameritrade Inc, Raymond James, HDVest – Wells Fargo, Fidelity Retails Funds Network, ING Financial Advisers – SAS Funds, etc. The top ten holdings of this fund as of December 2010 are Tyson Foods Inc A, Omnicare Inc, Countrywide Cap Iv Pfd, MeadWestvaco Corporation, Ford Motor Co, Bk Amer Pfd, Amer International Group, Wells Fargo Cap, Fifth Third Cap and ING Groep. These ten companies represent 42.21% of the portfolio. The Interpid Capital fund is looking for capital appreciation in long-term period and to provide high current income. The assets are invested in undervalued (small and mid-capitalization) equity and high yield securities. Those securities have less than $15 billion of market capitalization or their market value is less than the intrinsic value of the company issuing the equity security. There is no duration limitation for the high yield securities but typically will be in securities having two to six years duration at the time of purchase. Since its inception in January 2005, Mark I. Travis has been the lead manager of this fund. He is also the founding partner and has been at Interpid Capital since its inception in 1994. The ICMBX fund requires a minimum of $2,500 to open either a brokerage or IRA account in this fund with $100 of minimum subsequent investment. This fund has no sales-load fee, but there is 0.25% 12b1 fee. The last dividend distributed in March 2011 was 0.03%. It has 1.45% of annual expense ratio. The other class of this fund is Institutional Class (Ticker: ICMVX). This fund can be purchased from 47 brokerages such as E Trade Financial, JP Morgan, Schwab Retail, Vanguard NTF, Raymond James, TD Ameritrade Retail, Common Wealth Universe, Fidelity Retail Funds Network, Protected Investors of America NTF, etc. 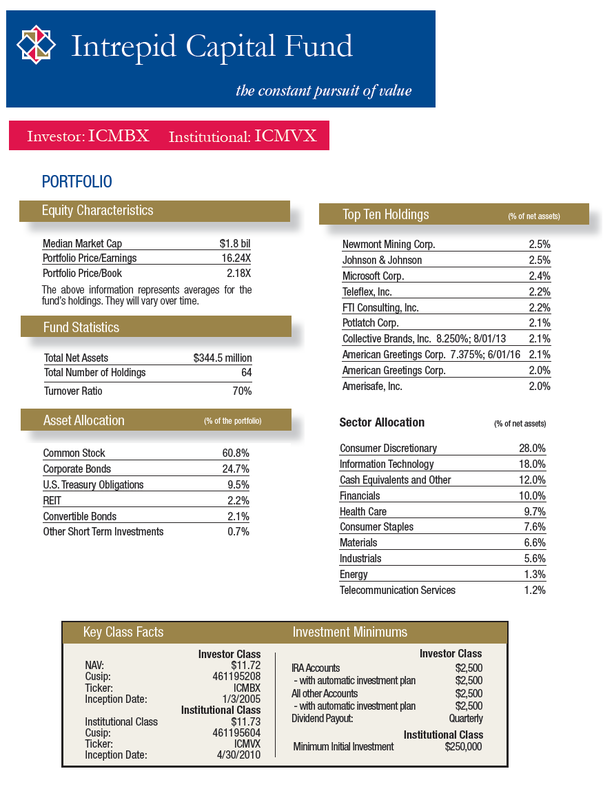 ICMBX has returned 11.29% over the past one year, 10.24% over the past three years and 9.26% over the past five years. The ratio of up compared to down years in term of return performance is 4:1. In 2009, the fund has its best 1-year total return with 31.28% of total return. Currently it has 9.26% of average 5-year return. The top holdings of Interpid Capital Fund as of March 2011 represent 22.31% of portfolio. They are Newmont Mining Corporation, Johnson & Johnson, Microsoft Corporation, Teleflex Inc, FTI Consulting Inc, Potlatch Corp, Payless Shoesource, Amer Greetings, American Greetings Corporation and Amerisafe Inc.
More funds on part 2 article.